Each week I create a project from Stitch magazine or one of our Sew Daily products. The sew-along blog is posted each Friday. I hope you will join us in making this extraordinarily simple skirt! For this week’s project, I am going to make the Shifting Plaids skirt that was featured in my editor’s letter picture in Stitch Summer 2015. You can purchase and download the instructions on Shop.SewDaily.com. You are going to love this project, because you don’t have to tape a pattern together! It’s patternless! For the skirt, I used Lotta Jansdotter’s gorgeous, oversized gingham pattern called Follie by Windham. 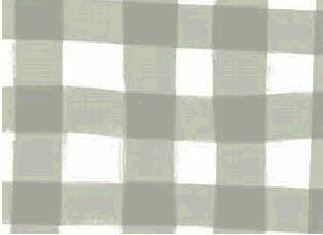 This is the best fabric for this skirt because the large scale gingham makes the pleating at the waist so easy, but you can also use another favorite gingham or plaid. This skirt is designed with the pleating at the waist that turns the squares into stripes. It’s just the coolest and so, so easy. We will gather our materials this week and get the project done next week. 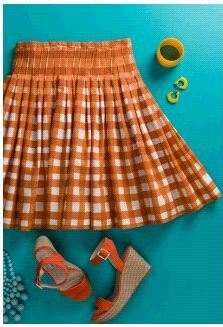 I created my editor’s skirt with the tangerine gingham, so I am going to do this version in gray. Also, in the original, I used the lengthwise fold of the fabric as the hemline. This time I am going to sew on a deep hem allowance, which is also super-easy and creates a quick couture look. To prepare for this project, all you need are your materials and waist measurement. Isn’t that fabulous! So get your fabrics and I will see you here next Friday. Visit the Sew Daily Shop to download the instructions for my Shifting Plaids Skirt. You can get the brand-new Stitch Summer 2015 here as well. P.S. If you want to learn how to make this project along with me live, you can attend the Original Sewing and Quilt Expo in Worcester, Massachusetts, April 16–18, where I will be teaching a course that provides the materials. We will make the skirt in class. I hope to see you there!